Root Canal Treatment is a fairly common procedure that has gotten a bad reputation. However, if you have never experienced a root canal procedure and you hear the dreaded words “You need a root canal”, you may find yourself feeling a bit nervous. The words “root canal treatment” may cause an uneasy feeling in your stomach if you don’t understand how and why your dentist performs them. Because of their bad reputation, root canals are viewed as one of the most painful dental procedures. The truth is though, there have been many advances made in the last few decades to improve the procedure. Treatment is often faster and more comfortable than many patients expect, but most importantly, a root canal (endodontic) treatment is often your best chance at preserving what may be left of a severely infected or inflamed tooth. Restorative dental procedures, like root canals, are designed to address the needs of a specific tooth and stop the occurring dental issue from progressing. A root canal treatment is used to treat an infection or inflammation in the inner pulp of the tooth. The inner pulp contains the tissues and nerves of your tooth. When an infection or inflammation is present you will likely be experiencing quite a bit of pain. Treating the tooth may be the only way to stop an infection from moving from your tooth into other areas of your body through your bloodstream and alleviate the pain you are likely experiencing. What happens if root canal treatment is not completed? If an infection is allowed to wreak havoc on the internal structures of your tooth (i.e. a root canal treatment is not done at the point where it could help), the tooth may require a necessary extraction. Extraction could be the last way to protect you from a spreading infection. 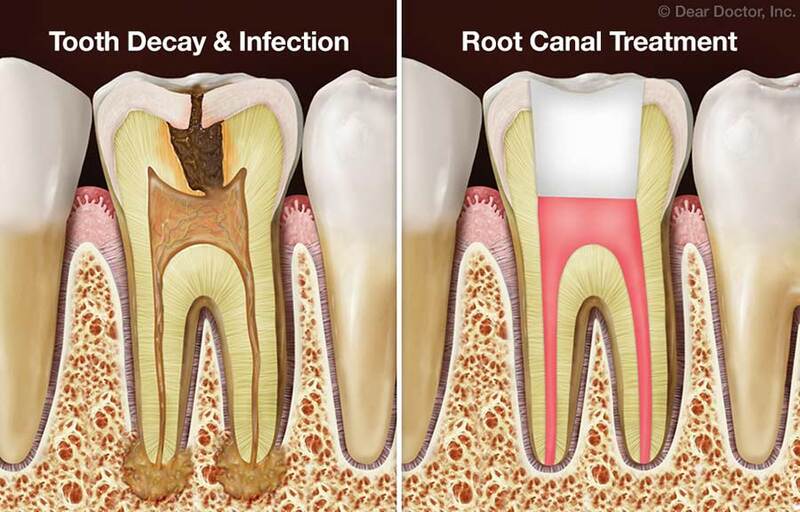 A root canal treatment can disinfect your tooth of the infection and restore it. A dental crown typically follows to cap a tooth that was treated with root canal treatment. A crown is placed to protect the remaining tooth structure. Once the root canal procedure is complete, there is no longer blood flow to the tooth, and this can cause it to become brittle. The crown protects the tooth during everyday use. A root canal treatment can save your tooth! Ignoring signs and symptoms of tooth infection can cause major issues. We hope that by sharing some information on root canal treatment it has helped lessen any fears you may have had regarding this dental procedure. If you have been experiencing pain or other symptoms of tooth infection, do not wait to schedule a dental appointment. The staff and doctors of Thomas L. Anderson and Associates are here to help you. We have three conveniently locate offices in the Kansas City Metro area. Contact us today to schedule your next dental visit!